Six weeks ago, in Bird Flu Spread: The Flyway Or The Highway?, we looked at the ongoing debate over the role that migratory birds play in the global spread of avian influenza viruses. A week later, in H5N8: A Case Of Deja Flu?, we compared the recent spread of H5N8 to the 2005-2006 geographic expansion of H5N1. While poultry producers are often quick to blame wild or migratory birds, not everyone agrees, with a recent statement by the UN CMS/FAO Co-Convened Scientific Task Force on Avian Influenza and Wild Birds stating that typically the spread of HPAI virus is via contaminated poultry, poultry products and inanimate objects although wild birds may also play a role. The reason this debate continues (aside from partisan interests on both sides of the debate) is that we lack an ongoing coordinated global surveillance system to show us exactly how these viruses traveled. While many countries conduct surveillance, it is often sporadic, reactive, and the standards and methods employed vary widely. Yesterday the EID Journal carried a letter from a number of international experts (representing the USDA, OIE, St. Jude Children’s Research Hospital, WHO, EcoHealth Alliance, etc.) calling for a coordinated effort to study these viruses in wild and migratory birds. Wild birds play a major role in the evolution, maintenance, and spread of avian influenza viruses. However, surveillance for these viruses in wild birds is sporadic, geographically biased, and often limited to the last outbreak virus. To identify opportunities to optimize wild bird surveillance for understanding viral diversity, we reviewed responses to a World Organisation for Animal Health–administered survey, government reports to this organization, articles on Web of Knowledge, and the Influenza Research Database. 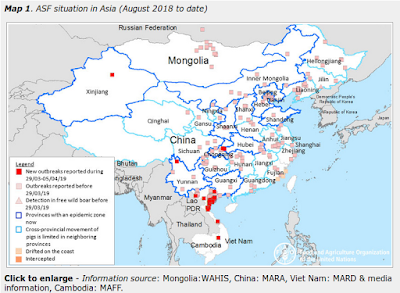 At least 119 countries conducted avian influenza virus surveillance in wild birds during 2008–2013, but coordination and standardization was lacking among surveillance efforts, and most focused on limited subsets of influenza viruses. Given high financial and public health burdens of recent avian influenza outbreaks, we call for sustained, cost-effective investments in locations with high avian influenza diversity in wild birds and efforts to promote standardized sampling, testing, and reporting methods, including full-genome sequencing and sharing of isolates with the scientific community. The cost of avian influenza virus outbreaks in poultry is substantial; outbreaks of influenza A(H5N1) virus during 2004–2009 caused US $30 billion in damage (29), and the frequency of highly pathogenic avian influenza outbreaks in poultry appears to be increasing (11). Rather than sporadically releasing large amounts of funding for wild bird surveillance when specific avian influenza viruses emerge, sustained national, regional, and global investments can provide the targeted baseline level of systematic surveillance we propose. Many countries, especially where avian influenza virus diversity in wild birds is highest, are already investing in some form of avian influenza virus surveillance in wild birds. Current efforts should be refined by leveling the investment roller coaster that has funded subtype-specific wild bird surveillance toward a lower-cost but long-term investment in collecting and sequencing wild bird avian influenza viruses. Global coordinating bodies, such as OFFLU (a network linking influenza experts and laboratories working with poultry and swine influenzas and World Health Organization expertise) (13), provide collaborative forums for government agencies and researchers to compile and share sequences and isolates. For wild bird avian influenza viruses specifically and all influenza viruses, we would be remiss not to work toward coordinated surveillance to support more effective assessment, preparation, and response for emerging influenza viruses that pose potential public health threats.